60 yr old male, has been having dysphagia and chokes on fluids and solids for about 2 yrs or more. The daughter who happens to be our nurse, says it is a pain to watch him taking food. His X-ray neck lateral shows big osteophytes between C2-3, C3-4, C4-5, C5-6, and C5-7. The ones C4-5-6 looks like a single unit. They are big and measures almost the antero- posterior diameter of the corresponding vertebral body. A CT done 2 yr back revealed nothing more than this. We couldn't do a Barium swallow for flimsy reasons, but it could be done about a week back, and since the software to record the same didn't work, we had to be contented by just seeing what was seen during fluoroscopy. 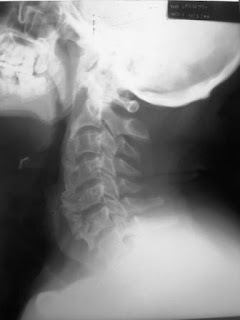 The barium went down without any hitch, negotiating the "C" projection of the C4-5-6-7 oteophytes at the root of neck. We sent him to our Orthopaedician, who asked for an MRI; but it couldn't be done, as he was unable to lie down for the same because of pain (Radiologist told the nurse-daughter) Hence a repeat CT was done (Is the position for CT different from MRI? ), which showed no change from the previous CT.
What next? 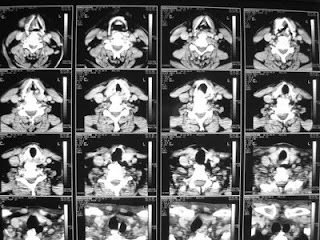 I am posting photograph of the X-ray Neck Lateral and relevant frames from a CT scan.